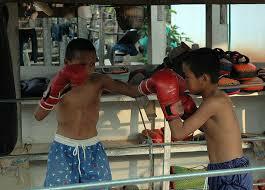 Thai Muay – Boxing like sport- but for kids aged between 6- 13 have been turning out in competition for quite some time. These kids have been the only earning source of their poor parents in Thailand (Siam). As these poor kids earn, the parents realize their dreams of having a house of their own. This sport is also one of the few avenues through which they can escape extreme poverty. The Girls and Boys wear colorful headbands and paint themselves and pray in their boxing ring corners before make the ritualistic dance in circles prior to the fight. This competition has been attracting the press and social media for quite some time for the unjust practices. The matches are at times dangerous for these growing up kids. They fight with all their might and get hurt. Their coaches yell and shouts at them – it is inhuman and kind of tortures. The boxing matches are played with open betting by the public. The major portion of the stake goes to the Coach. Its irony that the career of the kids is over by age of 17 years. The sport is known for fighting with eight limbs or eight points “points of contact.” Making use of punches, kicks, elbows and knee strikes, thus using eight points as opposed to two points (fists) or four points hands and feet used in other more regulated combat sports, such as kickboxing and savate. 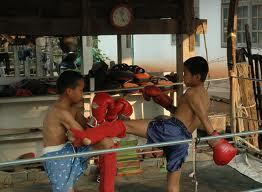 This sport is originates from pahuyuth (from the Sanskrit bahu-yuddha meaning unarmed combat). The ascension of King Chulalongkorn (Rama V) to the throne in 1868 ushered in a golden age not only for Thai Muay but for the whole country of Thailand. Muay progressed greatly during the reign of Rama V as a direct result of the king’s personal interest in the sport. The country was at peace and Muay functioned as a means of physical exercise, self-defense, recreation, and personal advancement. For your information there are world Muay Thai competition, associations and organizations all over. The thing to worry is that there is so much inequality in the world and specially in Thailand that Thai Muay for kids is the living and glaring example of injustice. Thus the responsible people of the world should think of ways to make lives of poor populace of the world better. Not just in Thailand, but everywhere.